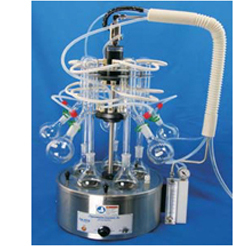 The S-EVAP-RB solvent evaporator for round flasks allows for up to 8 or 10 samples to be concentrated at once. S-EVAPs have a broad range of applications including oil and grease analysis using Freon and other approved solvents and concentrating extracted materials from Soxhlet operations. The instrument consists of a base and stands assembly, mounted in a shallow round bath. The entire instrument rotates so that all samples are accessible from the front. At each sample position the round sample flask rests on the bath cover disk and is heated by hot water and steam. The solvent boils from the flask and cools in the condenser which is attached to a centrally located water manifold. The solvent leaves the condenser through a specially designed side arm into an individual collection flask. Solvent recovery through individual collection reduces laboratory emissions and increases laboratory and environmental safety.